Stayed here for 3 nights on a hen party. Location was great for the strip; only about a 5 minute walk to the bars. There were 12 of us; 10 got great rooms overlooking the pool and bay. Me and my friend got the grottiest view imaginable. We asked to be moved but receptionist said we had not paid for a sea/pool view. Strange; we had all paid the same. Food and snacks in hotel very good, Pool/pool bar ok but pool looked a bit murky (but it was early in the season). Would definitely stay here again. Close to the strip but far enough away to have a goods nights kip. The rooms were very clean and the towels etc changed regularly. Great inexpensivwe supermarket located at the basement of hotel. Wouldn't be any good for anyone with walking difficulties as the hill is very steep but good for keeping you fit when you have over indulged. the hotel was perfect! We were slightly unsure at first weather to book this hotel at first, as many reviews stated that there was a really sleep hill. But that din not stop us, plus it gives you a bit of exersice after a good night out in magaluf. There was plenty of room in the apartment which more than comfortably houses two adults. We found the vsita sol apartments to be cleaned regular towels changed every second day if required. The staff were pleasant and helpful. the steps side close at 22.00. The pool area is well kept and a lifeguard was there although there were never enough parasols and I doubt in the high season there would not be enough sunbeds either. We had a good holiday and would certainly use these apartments again. Although I would not like to use the 1 bed apartment for 4 adults. The hotel was lovely,thought Id arrived at the wrong one at first because we got it cheap and it looked really posh! The staff were really friendly throughout the stay and couldnt help enough. The entertainment seemed good but didnt stay there for that,prefered to go out in the town and into Palma Nova. You have got plenty of pubs and shops nearby and the room we stayed in faced the beach and you woke up looking at the sea..and even in November the weather was 23 degrees unlike the UK! Couldnt fault the place at all. Well worth it and I would recommend it to anyone. Hotel was Fab, perfect place great for getting to the clubs and pubs. Tere was a big group of us and the rooms were fab, our balcony was fab and did the job for the cocktails haha! This hotel is great. It is very clean, there are fresh towels every day, the shower is nice and there's a bath too. You get everything you need to cook some basic meals which is always helpful and there is a supermarket in the basement which sells everything you will need. 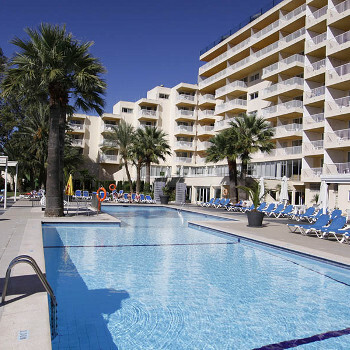 The location is right in the middle of Magaluf and is excellent if you like clubbing.